Most dangerous volcano in North America: Popocatépetl, Shasta, Hood, or Rainier? Family, friends, trust me: Not everything in Mexico is scary. Smoke rises from Popocatépetl as it spews incandescent volcanic material near Puebla, Mexico, on July 4, 2013. This article originally appeared in The Last Word on Nothing. MEXICO CITY—When you live in Mexico, you get used to people in other countries thinking you are in a war-zone sort of apocalypse state. If it’s not narcos, it’s earthquakes, kidnappers, or chupacabras. 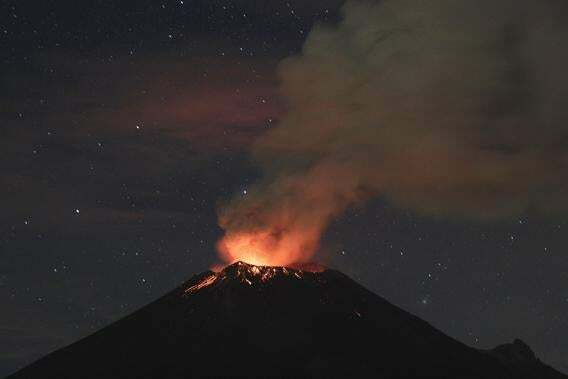 These days, the thing for Americans to fear in Mexico is the volcano Popocatépetl, lovingly called Popo, which is chucking ash all over the place. Notice that many reports find it necessary to give Mexico City’s population alongside reports that it’s active. As if that number might drop significantly, very soon. Now, for those who live here, it all seems silly. I didn’t even notice the ash—though some of these reports make you think it is piling up on the sidewalks. I have noticed the air quality is a little off for the middle of the rainy season (when afternoon showers clean the skies). But all in all, the rumbling of our hulking neighbor hasn’t affected me. Far more annoying is the whole since-you-live-in-Mexico-you’ll-probably-be-dead-tomorrow attitude from friends and family. It’s really terrible and borderline racist. But that’s not to say I won’t use it to get a story. The last time Popo was spewing ash, I decided it was a great chance to write a story tentatively called “Popo: The Most Dangerous Volcano in North America.” The story came out of a drunken conversation with a geologist at a Bob Dylan concert near the heart of the city. A few beers in, he gave me the impression Popo was about to level the city. So I called up Robin Lloyd at Scientific American and told her I had a story for her. “What kind of question is that?” I thought. Of course it is. It’s in Mexico, and everything in Mexico is dangerous. Popo will blow, and millions of people will die. Cut. Print. Just to be sure though, I called up Randy White, a volcano expert and part of the Volcano Disaster Assistance Program, which monitors volcanoes on the continent and around the globe for U.S. Geological Survey. White tells me that a volcano’s danger is related to a) how likely it is to explode, b) what kind of explosion it will create, and c) how many people live nearby. This can be expressed mathematically in the following equation (careful, it’s a little technical). Contrary to what many news reports would have you assume, Popo is 40 miles away, not near enough to threaten Mexico City. (Unless lava runs uphill—it doesn’t, right?) However, it is close to Puebla, the country’s fourth-largest city. And certainly it’s a little erupt-happy. So Popo is still North America’s most dangerous volcano, right? Great. So now my story is “Popo: Probably Among the Pretty Dangerous Volcanoes in North America. Maybe.” It seems that Popo is just too predictable to be considered a properly dangerous volcano. Like me playing poker, it’s easy to tell what Popo is about to do. Plus, it vents off all its gas rather than storing it up, waiting to explode (like a Coke bottle that slowly leaks out as opposed to a sealed one that’s all shook up). If it were to stop rumbling for 20 years or so, then White says he might start to worry. In fact, Popo is such an easy read that there’s evidence people living in Mexica (or Aztec) times actually knew when it was going to erupt, moved off the slopes of the mountain, then came back and resettled after it had calmed. Also, there’s the type of explosion. Generally speaking, thicker, more silicon-rich lava causes volcanoes to explode violently. Runnier stuff makes for impressive lava squirts, as in Iceland or Hawaii, but it doesn’t tend to blanket the continent in ash like Mount St. Helens did. And Popo is on the runnier side. So I ended the conversation deflated. My Mexico (Danger! Danger!) Volcano Killing the World story was dead. But before I hung up, though, I asked White what is the most dangerous volcano in North America. He thought for a minute and then listed Mount Shasta in California and Mount Hood in Oregon, which are unpredictable but too remote to cause much harm. 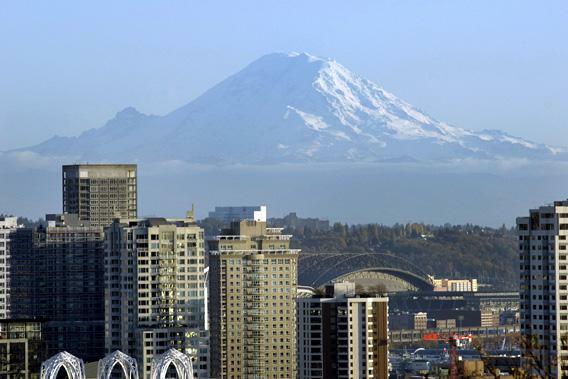 “But the one that probably keeps me up at night the most is Mount Rainier,” he finally says. It seems that not only is Rainier far more mysterious than Popo, but its chemistry points to a more viscous, explosive eruption. Plus, it hasn’t erupted in more than 100 years, sitting, building up pressure. And, of course, Tacoma, Wash., is right there at its foot. If it decides to get nasty, the first thing it will do is melt its snowcap, thus creating destructive landslides of slushy mud, called lahars. So there you have it. If you like to play it safe and avoid dangerous places and you live in Tacoma, think about relocating to Mexico City. Our volcanoes are more friendly. This article originally appeared in The Last Word on Nothing. Tagline: “Science says the first word on everything, and the last word on nothing”—Victor Hugo.